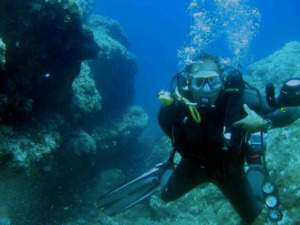 Looking for scuba diving Playa Flamingo Costa Rica? Dont look further. You are on the right side. We work in Flamingo with 3 excellent Diving Centers. The most popular diving spots in Guanacaste are the Catalina Islands. The Catalina Islands are rocky volcanic outcrops. About 2 to 8 miles from Playa Flamingo (Boatride about 15 to 25 minutes). 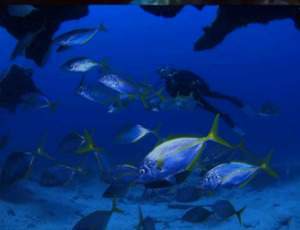 The Islands provide the choice of more than 30 different dive spots. For advanced divers and for beginners. The marine life at the Catalina Islands are really awesome. 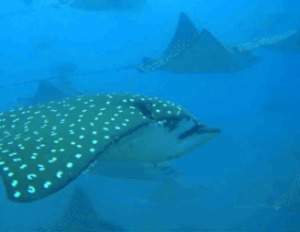 A few examples, what you can expect: Sharks, Turtles, Manta Rays, Eagle Rays and a variety of tropical fish. Pick up Service? Of course, we pick you up without extra costs. Guests from Tamarindo at 6.45 am, from Playa Conchal (Westin) at 7.00 am and from Flamingo at 7.15 am. And all the places that are on the way. Please, let us know where you stay in the booking form below. Not certified divers: You have to go for a Discover Suba Diving course (beginners, pool lessons + ocean dives). 7.15 am to 12 am or 1.15 pm to 5.00 pm – US$ 165.00 per person including all fees, pick up and drop off service. This course is an experience only and does not result in any type of certification. 1. I’m interested to book your Costa Rica diving Flamingo trip, but I’m a certified diver and my wife is not. Can we dive together? 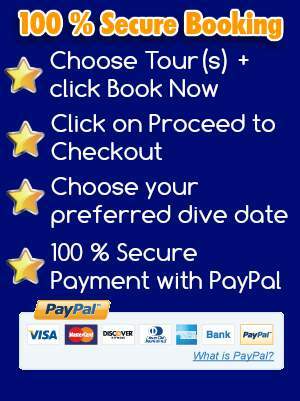 Answer: Select 1 or more diving tours below. Click then on Proceed to Checkout. Choose your preferred dive date and send us your reservation. On the next page you can pay the tours 100 % secure with PayPal. Answer: The tour starts with picking up our guests from Tamarindo and Langosta (6.45 am), from Playa Conchal + Westin (7.00 am) and the other places that are on the way. Without extra costs. In Playa Flamingo starting the boat ride with briefings from your dive instructor regarding the dive and boat safety and procedures. Keep your eyes open for dolphins, rays, turtles and whales (in season). We choose two dive sites, weather and daily conditions depending, to perform 60 ft max dives, 40 ft if your certification is restricted, exploring one of the best places to dive in Costa Rica: the Catalina Islands in the Pacific Ocean. You have the possibility of seeing sharks, giant Manta rays, spotted Eagle rays, octopus and so much more. The variety of life in this ocean is astounding. IMPORTANT: A refresher course can be undertaken before the boat leaves for those who have not been diving in a long time or who do not have much experience. Answer: Fresh water and ice tea, fruit and cookies provided. 2-tank scuba dives (includes BCD, Regulator, Mask, Fins and Snorkel, Weights and Weight Belt). Answer: Medically approved if there has been any major health issues or changes since last dive. Book your diving in Playa Flamingo tour with us and you’ll never be disappointed. So you can be sure that you will have the best diving in Costa Rica ever. 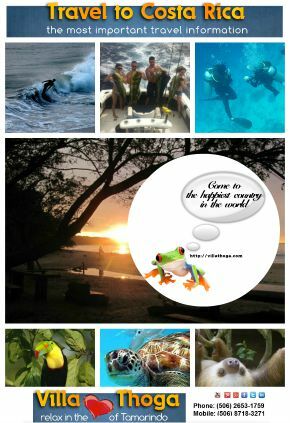 If you have further questions about Catalina island diving Costa Rica, please use our contact us form. We are happy to help you out. For those who need more information about Playa Flamingo, we recommend to visit a) the Playa Flamingo Costa Rica map on Google and b) wikipedia, search for Playa Flamingo Costa Rica wikipedia.